NEW ORLEANS (AP) Anthony Davis’ authoritative put-back dunk in the final minutes summed up a night on which his relentless play around the basket forced Phoenix’s three tallest players to foul out. 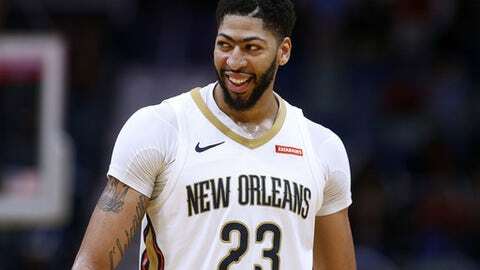 Davis scored a season-high 53 points, grabbed 18 rebounds and blocked five shots, and the New Orleans Pelicans extended their winning streak to six with a 125-116 victory over the hapless Phoenix Suns on Monday night. Davis has scored no fewer than 27 points in a game during New Orleans’ streak, scoring at least 38 five times and more than 40 four times. After the 6-foot-10 Davis hit his 21st free throw, the Suns had to guard the Pelicans’ All-Star power forward with 6-foot-8 small forward Josh Jackson because 7-footers Dragan Bender and Alex Len and 6-foot-10 Marquese Chriss had all fouled out with nearly five minutes still to play. Holiday scored 20 points for the Pelicans, whose season-best unbeaten run has pulled them into a tie with Portland for fifth place in the Western Conference despite being without All-Star DeMarcus Cousins, who was lost for the season Jan. 26 with a torn Achilles. Emeka Okafor, brought back to the NBA for the first time since 2013 about a week after Cousins’ injury, scored 14 points. Devin Booker had 40 points and 10 rebounds for Phoenix, which lost its 10th straight and still has not won this month. T.J. Warren added 23 points and Josh Jackson had 20 points and 12 rebounds for the Suns, who led by as many as 17 in the second quarter but fell behind for good with about five minutes left in the fourth quarter. New Orleans native Elfrid Payton scored 16 points, and his layup pulled Phoenix within 116-114 with 2:29 left, but the Pelicans scored the next five points on Darius Miller’s 3 and Holiday’s driving dunk, and Phoenix did not threaten again. Pelicans coach Alvin Gentry angrily called a couple timeouts in the first half after watching Phoenix score easily on open shots. The Suns entered the game ranked 28th in field goal percentage, shooting 44 percent for the season. But they scored 36 in the first quarter on about 54 percent accuracy. Phoenix led by as many as 17 when Jackson soared down the lane for a one-handed put-back dunk and added free throws on the next possession to make it 52-35. Davis helped the Pelicans pull back within single digits by halftime. He dunked three times – twice on alley-oops – to go with a tip-in, three free throws and two blocked shots during the rest of the second period, and New Orleans trailed 65-58 when the half ended. Suns: Bender fouled out with 9:20 remaining, Chriss exited with 8:47 left and Len fouled out with just under five minutes remaining. … Booker has 18 30-point games this season … The Suns made five of their first six 3-point attempts before missing 16 of their last 18. Pelicans: F Nikola Mirotic had 10 points and eight rebounds. … Rookie Walter Lemon Jr., signed to a 10-day contract last Wednesday, scored his first career points on his only shot – a floater high off the glass late in the first quarter. Okafor’s best offensive game of his comeback came the same day the Pelicans extended his contract through the rest of the season. The 35-year-old former UConn star, sidelined four-plus seasons by a herniated disk, initially returned to New Orleans on a 10-day contract and played out a second 10-day deal before his latest extension. He saw his first action on Feb. 3. Suns: At Memphis on Wednesday night. Pelicans: At San Antonio on Wednesday night.